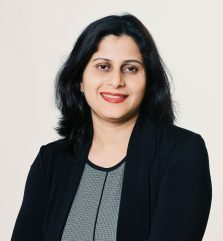 Deepti Vithal, Esq. focuses her practice on corporate law, real estate closings and U.S. and cross-border transactions, customs, regulatory compliance, and commercial contracts. She represents clients in joint ventures, foreign market entry, commercial and real estate transactions. Deepti has been involved in drafting and negotiating complex contracts on joint ventures, technology transfers, software development, technology consulting, licensing and distribution. Deepti also advises clients seeking consultation on Indian laws & regulations. She has significant experience in counseling US companies on India legal-business strategy and joint ventures. Deepti believes in giving back to the community and speaks frequently on corporate and international transactions and India business. She also serves on executive boards of nonprofit organizations and helps clients on a pro-bono basis. Contact Deepti Vithal, Esq. at deeptivithal@pasricha.com.